Mini Paint Zipbin Playset - RETIRED! 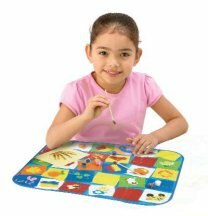 Home > ZipBin & Quick-Bin Playmats and Storage - Most are Retired & Hard to find - now 20% off! > Mini Paint Zipbin Playset - RETIRED! The Mini ZipBin Paint Playsets are great for on the go fun and just the right size for "In The Car" play. The mini "lap-sized" bin is covered with colorful dynamic graphics inside and out. Ready to Play? Unvelcro the corners and you have an activity mat perfect for a new fantasy play world. When your child is done with his adventure, quickly velcro the corners, put the toys inside, and your child's play space is clean again. Includes 10 Watercolor Paints, 1 Brush, Mini Sketch Pad! Mini Bin Dimensions: 8" x 5" x 5"
Mat Dimensions: 18" x 16"